"Harold Pinter's first play, The Room, features in a triple-bill directed by Pinter's colleague and friend, Patrick Marber. An all-too-familiar and frighteningly topical brand of English xenophobia runs through this darkly funny and unexpectedly odd play from 1957. 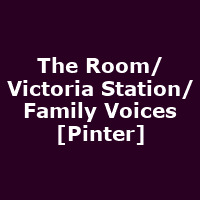 In the hilarious Victoria Station and the reflective Family Voices, isolated voices attempt to communicate, but can we ever truly express the depths of our feeling?" The 2018/19 West End cast includes Jane Horrocks, Emma Naomi and Nicholas Woodesen.